If a major American studio falls in the forest, does it make a sound? To the average movie fan in 1956, probably not. 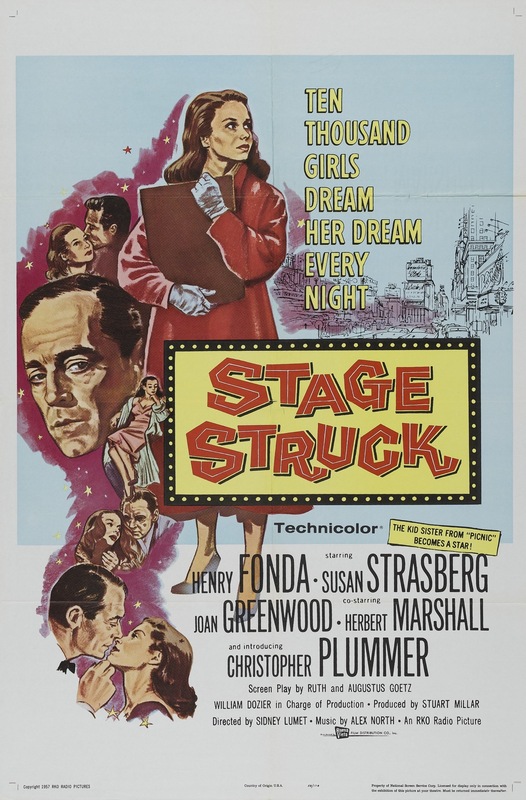 For those who got their Hollywood news from Hedda Hopper’s syndicated newspaper column, RKO’s Stage Struck sounded like business as usual, with casting news and production leaks coming at regular intervals. Early chatter had pegged Jean Simmons for the starring role of ingénue actress Eva Lovelace, but Bill Dozier, Joan Fontaine’s ex-husband and producer of high-class fare like Letter from Unknown Woman, now held the reins at the newly restructured RKO and had his sights set on Susan Strasberg. The 18-year-old actress, daughter of legendary acting instructor and Method prophet Lee Strasberg, had already acquitted herself with supporting parts in Picnic and The Cobweb, but her profile had been raised immeasurably by the Broadway success of The Diary of Anne Frank, then in the midst of a run that would exceed 700 performances. Strasberg was signed. Cameras would roll in January 1957 in New York City. Henry Fonda’s participation was announced in August 1956. That same month, Sidney Lumet was attached as director. This spoke to enormous confidence in the theater- and television-trained Lumet, whose feature debut 12 Angry Men had already been shot but would not be released by United Artists until the following spring. Herbert Marshall was added to the rolls in September and Christopher Plummer in December.